After an extensive renovation, the Highland Strip is ready to reveal its newest occupant. The Bluff, a concert hall meets sports bar located at 535 S. Highland St. and adjacent to the new Newby’s, will open its doors Monday, Jan. 9, at 5 p.m.
Nickle Smith, Hudson Chadwick and Austin Wallace — owners of The Bluff — signed a lease for the tenant bay in April 2016 from Loeb Properties Inc. Chadwick also owns Rafters in Oxford, Mississippi. Since signing the lease, the trio has transformed the space into an 8,000-square-foot venue complete with three bars — about 100 total linear feet of bar, to be exact — two outdoor patios, a main stage and more than 30 TVs for sporting events. One of the three bars is located on a mezzanine level overlooking the stage. The Highland Strip is about to get a new music savvy tenant with an affinity for a good drink. The Bluff, a music venue/restaurant/bar combo will open at 535 S. Highland St. by mid-January. Nickle Smith, Hudson Chadwick and Austin Wallace, owners of The Bluff, signed a lease with Loeb Properties Inc. for the tenant bay this past April. Since that time, they have transformed the empty shell into a concert hall complete with a mezzanine level, outdoor patio and 100 total linear feet of bar. Bands that perform at The Bluff will have their own greenroom and private bathroom. “We definitely have had a lot of people contact us, but we haven’t booked anybody yet, just due to the fact that we haven’t set an opening date,” Smith said. Yesterday, it was all about the cookies. Today, it’s burgers. A building permit was filed Wednesday, Sept. 14, for a new Insomnia Cookies location in the U of M area. Thursday, Loeb Properties – developer of the Highland Strip – announced that it had signed Burgerim, an Israeli-based burger chain that sells mini burgers by the box. Burgerim was founded in 2011 and has since spread around the globe. Customers can by a duo, trio or party box with 16 mini-burgers. Burgerim is known for its “always more than one” concept. Burger patties are 2.8 ounces each. The University of Memphis is hoping to use increasing tax revenue from the area surrounding its campus to fund road and infrastructure improvements. With new developments going up along Highland, the University of Memphis is working to turn the area into a Tax Increment Financing (TIF) district. Extreme makeover Highland Strip edition is in full swing, and one of its future tenants plans to bring a piece of the Big Easy to the Bluff City. 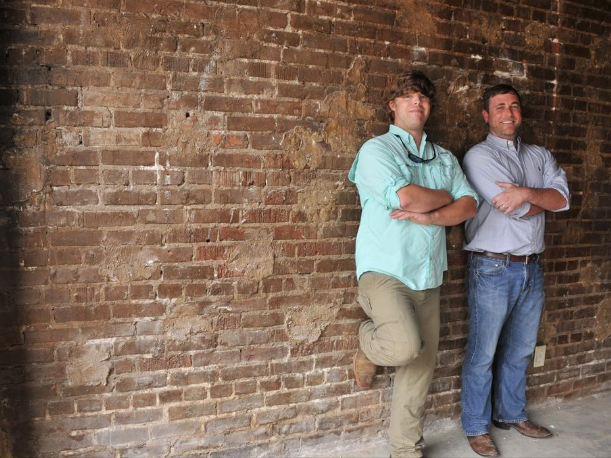 Smith, Chadwick and Austin Wallace are the three people behind the future music hall, restaurant and sports bar mashup. Chadwick also owns Rafters Music and Food and The Corner Bar in Oxford, Mississippi.